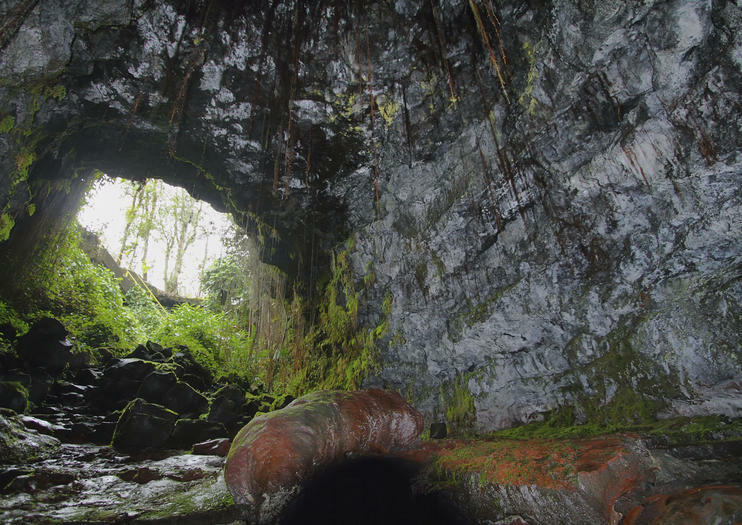 Located just outside of Hilo, the Kaumana Caves are part of a 25-mile (40-kilometer) lava tube that formed in 1881 from lava flow from Mauna Loa. Easily accessible, the Kaumana Caves are a great alternative for those looking for a more adventurous, and less crowded, experience than the Thurston Lava Tubes. Concrete stairs take you down to the Kaumana Caves’ entrance, a skylight that formed when part of the lava tube collapsed. There are two paths; the one to the right leads to a larger cavern than the left, but both can be explored. Keep your eye out for a diverse array of lava formations, including red-colored rock—lava that cooled so fast it retained its red color. Up to 2 miles (3.2 kilometers) of the caves can be explored independently, before you end up on private land. Visitors can also opt to join a volcano-themed tour that also stops at Volcano National Park, Mauna Kea State Park, or MacKenzie State Park. It’s free to enter the Kaumana Caves. Be careful crossing the road from the parking lot to the entrance. The caves are not illuminated, and it will get very dark after about 200 feet (61 meters); bring flashlights or headlamps if you plan to go any farther. Wear closed-toed, nonslip shoes; the ground can be uneven and slippery. Consider bringing a light jacket as water can drip from the ceiling. Those planning on any serious exploration should wear long pants, bring plenty of water, and consider a hard hat, gloves, and knee pads. Be careful leaving valuables in your car, as thefts have occurred in the area. The Kaumana Caves are located just west of mile marker 4 on the Hilo side of the Saddle Road (Highway 200). From Hilo, it’s about a 15-minute drive. Parking is located across the street. The Kaumana Caves can be visited at any time, and the cooler temperatures inside will be a relief on a hot day. Avoid going too far into the caves when there is a serious rainstorm, as there is a potential for flooding in some sections. The same lava flow that created the Kaumana Caves threatened the town of Hilo in 1881. Legend has it that Princess Ruth Ke’elikolani came over from Honolulu, camped directly in front of the lava flow, and prayed to the goddess Pele to spare the town. The lava flow stopped 1.5 miles (2.4 kilometers) from Hilo Bay. Hawaii's naturlige vidundere er ikke kun på land og i havet-Big Island er også en førsteklasses stedet, hvorfra man kan beundre solsystemets vidundere. Denne tur er den eneste, der omfatter både eftermiddags solbeskyttelse og nattspil, ledsaget af astronomiske eksperter. Besøg Rainbow Falls og Kaumana lava huler, så udforske Hawaii Volcanoes National Park og brug et ultramoderne sol teleskop og Dobsonian teleskop til at se sollys, galakser, stjerneklynger og planeter. Se to af de største vulkaner i verden og stop ved en af ​​de mest aktive på denne daglige ekskursion på små grupper. Først kør du mellem Mauna Kea og Mauna Loa vulkaner, og stopper til frokost på Mauna Kea State Park. Så kig efter nuværende aktivitet på Kilauea Volcano, den mest aktive af de fem vulkaner i Hawaii. Gå til Kilauea National Park for at se de smukke landskaber og nyd middag på Kilauea Lodge. Endelig stop ved Jagger Museum for at se natten glød på Halemaumau Crater. Hotel afhentning / drop-off inkluderet. Oplev den bedste vulkan tur på øen Hawaii! Rejser i luksus og komfort til Hilo side af øen i vores Mercedes Benz minibusser langs Hawaii Islands bedste shortcut - Saddle Road. Du vil tilbringe dagen i den vulkaniske arv på Big Island, fra historiske strømme til de nyeste formationer lavet af den nyeste udbrud i Lower East Rift Zone of Kilauea. Gourmet picnic frokost og sit-down middag på Kilauea Lodge inkluderet.